WASHINGTON, D.C. -- College graduates who served in the military while enrolled in their undergraduate program are more likely to strongly agree that their college or university understood their unique needs than those who served in the military before enrolling in college. Thirty percent of all military service members and veterans strongly agree that their university understood the unique needs of military service members and veterans. This percentage increases to 40% among those who served while attending college, and decreases to 25% among those who served before enrolling in their undergraduate program. In 2008, the U.S. Department of Veterans Affairs greatly expanded the education benefits offered to veterans under the Servicemen's Readjustment Act of 1944, often referred to as the GI Bill. This expansion, commonly known as the Post-9/11 GI Bill, provides veterans who served on active duty after Sept. 10, 2001, with unprecedented education benefits, including a living allowance, money for books and the ability to transfer benefits to a dependent. As a result, veterans and their dependents are enrolling in postsecondary programs at high rates throughout the U.S., forcing colleges and universities to evolve to meet their unique needs, including the need for specialized health services and financial counseling about the education benefits available to this population. 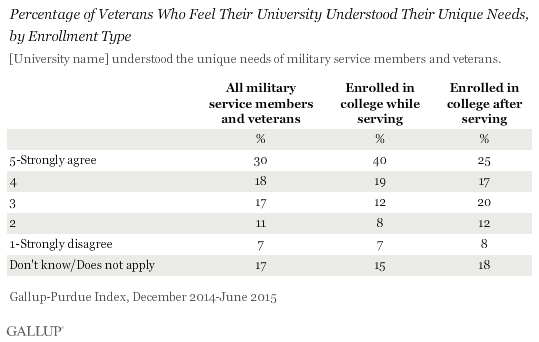 In its second year, the Gallup-Purdue Index sought to evaluate how institutions are performing in serving this population by asking those who served in the military, before or while they were enrolled in college, the extent to which their university understood the unique needs of military service members and veterans. Less than a third (30%) of all military service members and veterans who served before or during their undergraduate program strongly agree that their university understood the unique needs of military service members and veterans. The percentage strongly agreeing with this statement is higher among those who served while they were enrolled in their undergraduate program (40%) than among those who attended college after serving in the military (25%). These differences suggest colleges and universities have a better grasp of the issues active-duty military service members face in their undergraduate experience than of the issues encountered by returning veterans. These results are based on the second annual Gallup-Purdue Index study of college graduates. The study is a joint research effort with Purdue University to examine the relationships between the college experience and college graduates' lives afterward. The Gallup-Purdue Index study is a comprehensive, nationally representative survey of U.S. college graduates of all ages with Internet access, conducted Dec. 16, 2014-June 29, 2015, with a random sample of 30,151 college graduates with a bachelor's degree or higher, including 3,722 graduates who have served in the military, which includes the Reserve and National Guard. Military service members and veterans who obtained their undergraduate degree from private colleges and universities are more likely than public college graduates to strongly agree that their college or university understood the unique needs of the military service member and veteran population. About a third of private not-for-profit (36%) and private for-profit (34%) graduates strongly agree with this idea, compared with about a quarter (24%) of public college graduates. The size of institutions may partially explain differences in responses between graduates of public and graduates of private institutions. Military service member and veteran college graduates who obtained their degree from relatively small colleges or universities (with undergraduate enrollments lower than 10,000) are more likely than graduates who obtained their degree from larger colleges or universities (with enrollments of 10,000 or more) to strongly agree with this statement (32% vs. 26%). There is tremendous diversity within the military population, and while active-duty and returning service members require some of the same services, other needs differ. Although both groups require knowledgeable financial counselors who understand the complexities of the financial education benefits available to them, active-duty military service members may require more scheduling flexibility, while veterans are more likely to require specialized health services. Data from the Gallup-Purdue Index study indicate that colleges and universities may be more successful at meeting the needs of active-duty military service members than those of veterans. Colleges and universities will continue to benefit from experimentation with programs and support services for this population, as it is important that military service member and veteran programs be tailored to accommodate the diverse needs of these students. Additional results are provided in the Gallup Study of Veteran College Graduates. Results for the Gallup-Purdue Index are based on Web surveys conducted Dec. 16, 2014-June 29, 2015, with a random sample of 30,151 respondents with a bachelor's degree or higher, including 3,722 respondents who served in the military including the Guard or Reserve, aged 18 and older, with Internet access, living in all 50 U.S. states and the District of Columbia. For results based on the total sample of military service members and veterans, the margin of sampling error is ±2.3 percentage points at the 95% confidence level.